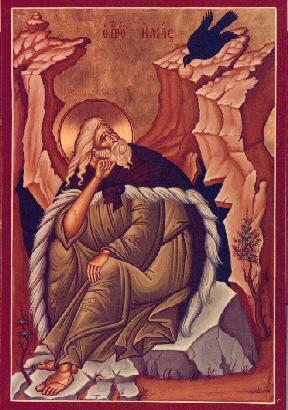 The prophet Elijah (Elias) said that the Lord was going to take him to heaven that day. Elisha, who was with him, insisted on staying with him until the end and asked for a double share of Elijah’s spirit of prophecy before he would be taken. Elijah used his cloak to divide the waters of the Jordan River and they crossed it. Elijah said to Elisha, if you see me part from you and ascend into heaven, your wish will be granted. As they walked along, a whirlwind separated them and Elisha saw Elijah ascend in a Chariot of Fire. In the icon, we see Elijah passing his mantle to Elisha, who afterwards used it to separate the waters of the Jordan River again. This showed that he had received Elijah’s spirit of prophecy. Tradition says that they stayed in the cave depicted before they crossed the Jordan. The parish building was dedicated to the prophet St. Elias on the day of his feast, July 20, 1969. It was a happy coincidence that it was the same day as the first landing on the moon. The symbolism of fiery chariots ascending to the heavens was not lost on the community! Symbolism aside, this parish prays that, as we dedicate ourselves to him, his spirit of prophecy will continue with us as well. Thereafter Elijah went to Mt. Sinai, where God had spoken to Moses, and on that holy spot he heard the words of God just as Moses had. He descended with instructions from God himself, among which was the instruction to appoint as his successor a man named Elisha, who later became a prophet of God in his own right. Elijah discovered that God was not necessarily a clap of thunder, a bolt of lightning, or a rumble in the hills, but he could be “a still, small voice”.